It’s Monday! That means it’s time for another Children’s Style Guide! This week’s Style Guide is a little different and a lot of fun. This is our second edition of the VIDEO style guide! The designer and founder of Taylor Joelle Designs, Jenny, will be showing you a spring look that she put together for her toddler boy. We know that you’ll be inspired! 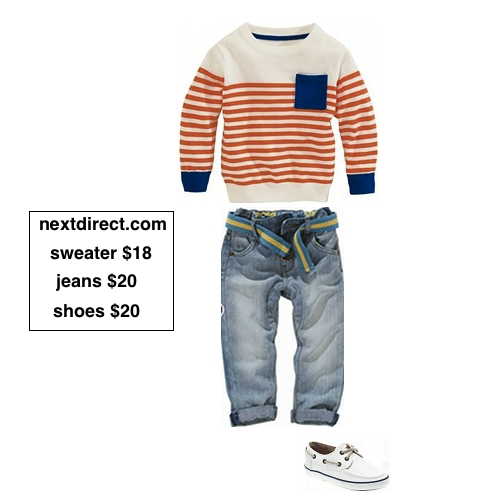 This look is perfect for your son’s spring wardrobe, and is affordable too! All items are from nextdirect.com and are $20 or less! Start the look with this Orange Stripe Crew Sweater. Next, add these Belted Carrot Fit Jeans. Finish the look with these White Boat Shoes. Be sure to follow our blog via email and/or Google Friend Connect (right side bar) to be inspired by our Children’s Style Guide every Monday! Stay tuned! Also, check out our Pinterest Board “Kid’s Fashion” for more fashion ideas from Jenny!